Sometimes you come across an app which makes you really enjoy using your computer. This is one of those apps; FocusWriter. I recently ran across what I think is a really cool writing app for students, writers and others looking for a rather light text editor with some rather nifty features. FocusWriter is described as: a fullscreen, distraction-free word processor designed to immerse you as much as possible in your work. The application’s window can be themed and includes some nice little features not found in most other text editors. FocusWriter autosaves your writing progress, and reloads the last files you had open to make it easy to jump back in during your next writing session. Some of the other features I think are really nice are a hiding toolbar and live stats bar. You can even “Theme” it to your liking with custom color schemes and even use your own images as backgrounds to get you really immersed in what you are writing. 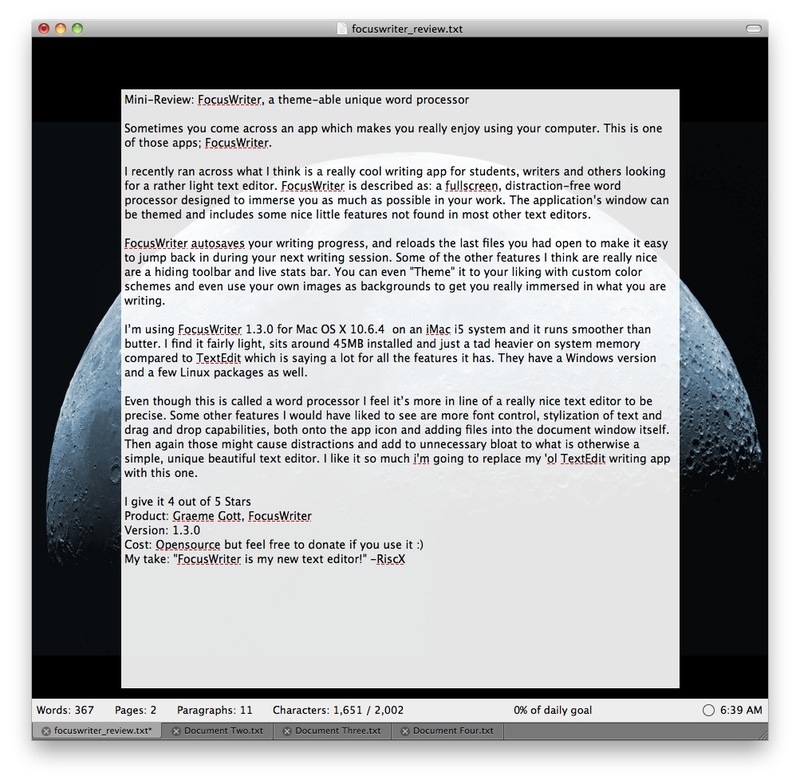 I’m using FocusWriter 1.3.0 for Mac OS X 10.6.4 on an iMac i5 system and it runs smoother than butter. I find it fairly light, sits around 45MB installed and just a tad heavier on system memory compared to TextEdit which is saying a lot for all the features it has. They have a Windows version and a few Linux packages as well. 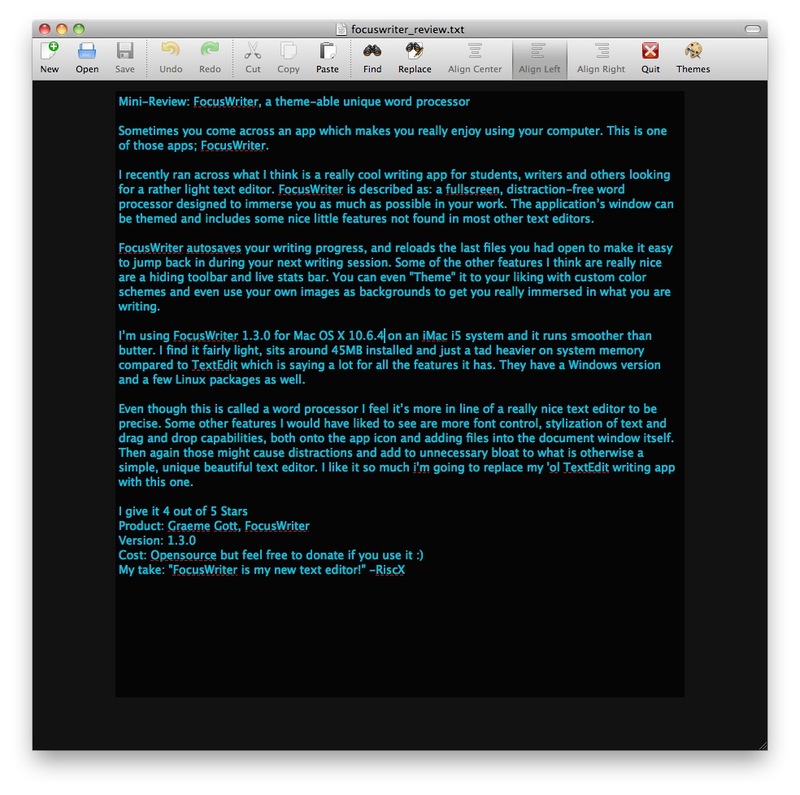 Even though FocusWriter is called a word processor I feel it’s more in line of a really nice text editor to be precise. Some other features I would have liked to see are more font control, stylization of text and drag and drop capabilities, both onto the app icon and adding files into the document window itself. Then again those might cause distractions and add to unnecessary bloat to what is otherwise a simple, unique beautiful text editor. I like it so much i’m going to replace my ‘ol TextEdit writing app with this one. FocusWriter main screen: Heres is one example of a "themed" main screen with background image, foreground colored with 70% transparency and colored text. You can toggle and extend the document window to full screen mode hiding the desktop entirely and simply focus on your writing task at hand. FocusWriter Toolbar: FocusWriter also lets you fully customize your toolbar with many options selecting only those you want to use and/display. Another random theme I set up as well. FocusWriter Stats-Bar: Smart feature which all text editors should include is the stats bar of your current writing projects, you can even have time limits and writing goals to again keep you focused 🙂 I really like the document tab feature letting you keep multiple document in one window such as your main writing piece with another tab holding notes and other tabs displaying other various documents/content related to your main work all in one simple window. Yet another theme I used.